Sunday. Denver, Colorado. There’s a roar that suddenly fills that oh-so-thin, mile-high air. A stadium packed to the gills has just witnessed exactly what it had hoped for. The sound doesn’t die down quickly, either. It goes for a while; people want to savor this one. Smiles. Fist bumps. High fives. Traffic leaving is a pain, because, well, it’s Denver, and because everyone waited until the bitter end. Read the above just about any time of year, or even read it out of context, and 99 percent of anyone who’s ever lived, does live, or will live in the great state of Colorado would conclude that it’s being written about one team and one team only. But it wasn’t. That was LoDo, not LoHi. It was August 13. And the victors were the Colorado Rockies baseball club. The excitement was real because, not only did the win come off of a 9th inning, walk-off walk, but it was the second walk-off win in as many games. 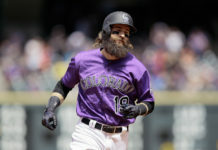 The Rockies just took three-of-four from the richer-than-Jesus Dodgers, closing the race in the NL West to a razor thin margin between Arizona (the current leader), the Dodgers (1.0 games back) and Colorado (1.5 games back). Just three days prior, Wade Davis, the highest profile closer the Rockies have ever employed, was booed off the field. In the first game of a four-game set against the Dodgers, Davis took the mound in the top of the ninth with the game tied at five apiece. He trudged off the mound down 8-3 after giving up two homers and getting hooked. Davis has made a habit of this sort of thing lately, and seemingly everyone at Coors Field knew it (and they weren’t exactly happy about it, either). 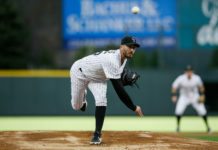 On Sunday, when he was given the ball in nearly the same situation – top of the ninth, tie ball game – the crowd at Coors instantly became as tight as the fiddle string used to play John Denver’s “Life on the Farm.” Mothers, grandmothers, children, Rockies fans of all shapes and sizes all knew about Davis. And nobody felt good about seeing him jog in from the outfield. But when Davis recorded two outs on two pitches, the crowd went from apprehensive to supportive. It was almost as if Davis went from Enemy No. 1 to the comeback story of the week. All of a sudden, the crowd was on its feet, cheering wildly for that third out. It was big – for Davis and for the standings. Then, he walked the next batter. The tension again grew thick. But after Joc Pederson grounded out to shortstop, the sense of relief – and perhaps some appreciation for Davis’ ability to fight through his recent struggles – was palpable. 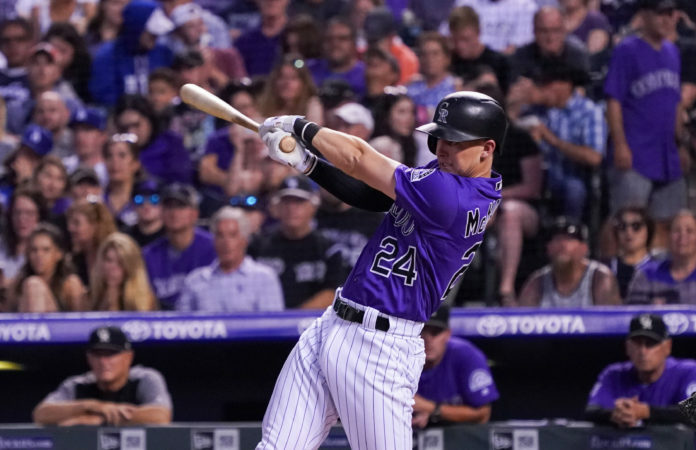 In the bottom of the ninth, when the Dodgers elected to intentionally walk rookie Ryan McMahon, the crowd booed with great displeasure – far more vehemently than two batters before when David Dahl was walked. Baseball fans who’ve paid attention of late know that it was McMahon who blasted a two-run, go-ahead, game-winning homer in the seventh inning of game two of the series on Friday night; they know he hit a walk off homer on Saturday night in game three. On Sunday, it sure felt like a huge percentage of those fans understood the significance of walking McMahon. They also knew the Dodgers were probably making the right move, but still, they wanted to see the red-hot rookie get one chance to do it again. As an East Coaster – a Brooklyn Dodgers fan, to be exact – he would know. Sure, we’re not New York, nor are we St. Louis or Chicago, but a meaningful series with an average attendance of 43,398 says something. 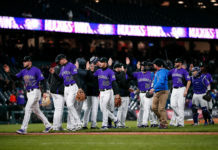 And this wasn’t a “Cubs Series” either – Rockies fans drowned out the Dodgers fans in attendance during the seventh inning rendition of “Take Me Out to the Ball Game”. There’s a social media uprising discouraging the wave, for crying out – we might just be growing up, Denver. Our town loves a winner; that’s just the way it is when there are roughly 27 other teams, ski mountains, hiking trails, rivers for fly fishing, and some kind of festival taking place every single weekend all vying for our attention. If your team doesn’t win, Denver loses interest – unless of course you’re the Broncos, and then people just get mad at you. The Rockies went to the playoffs last season for the first time since 2009. And this season they’re still very much alive in the playoff race – and it’s mid-August. Remember when everyone here used to joke, “Hey Rockies, just get us to the start of preseason football”? Well, it’s here. And it’s looking pretty bad. But I’m sure this morning, this baseball town will be busily talking about how Chad Kelly should move past Paxton Lynch on the depth chart, and about how Vance Joseph still doesn’t exactly resemble an NFL head coach. Or maybe we can put the temptation to talk Broncos aside. Maybe preseason football can take a backseat to the Rockies for once – because the local nine are damn sure worth talking about. Maybe, just maybe, we’re becoming a baseball town.